A B.C. man has been charged following an incident in August where he yelled a sexually explicit phrase at a reporter during an on-camera interview. A B.C. man has been charged with causing a disturbance after harassing a Kelowna reporter last summer during an on-camera interview. 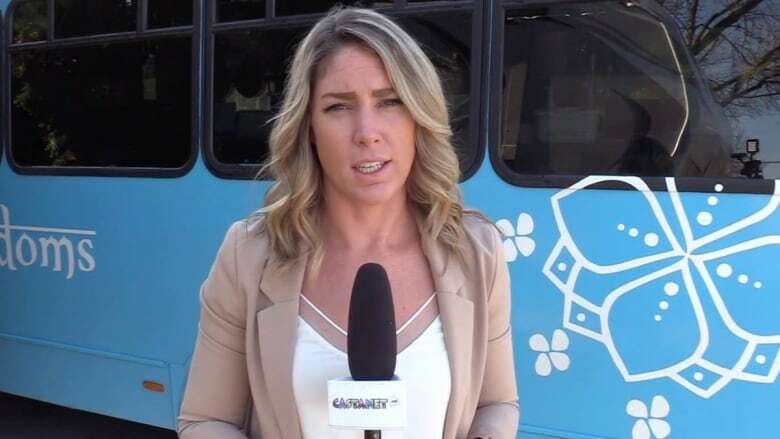 Bo Poirier, who has no fixed address but is known to travel between Kelowna and Penticton, yelled the sexually explicit phrase FHRITP — f--k her right in the p---y — while the reporter was doing her job. "Out of the corner of my eye, I saw someone kind of approaching us," Castanet reporter Alanna Kelly told Daybreak South host Chris Walker. "I kind of had an inkling of what was about to come." The incident left Kelly feeling humiliated and angry, so she decided to make her story public. She also filed an impact statement with police. "At the end of the day, I knew it was wrong," she said. "I knew it was not OK, and if I saw it happen to a fellow reporter or if I saw it happen to anyone, I think I would stand up and say something." B.C. RCMP Cpl. Dan Moskaluk said Kelly did the right thing in coming forward. "It's so immature. It is just unbelievable that any male individual would think that this is at all funny in any way," Moskaluk said. He hopes the charges send a message to the whole province of British Columbia that police will be taking incidents like this very seriously. Young men yell FHRITP at CBC reporter in Montebello, Que. RCMP have not been able to locate Poirier, and they have a warrant for his arrest. Once he is found, police will proceed with the charges. FHRITP originated in 2014 and has made headlines around the world. In February 2018, a St. John's, N.L., judge ruled that uttering the phrase on-camera isn't necessarily illegal. Kelly said she's received an outpouring of support from fellow reporters, but comments on social media indicate some people continue to defend these kinds of comments. As a reporter you should be aware that every Canadian has the right to free speech thanks to the Canadian Bill of Rights. I understand that the phrase spoken was offensive it in itself is not a crime and nobody was hurt so assaulted by them only offended. Offended is not a crime. "It started as a joke, but sexual harassment I don't think is ever a joke," Kelly said. "It's normally targeted towards female reporters while they're doing their jobs ... and someone yells these sexist, vulgar comments at you and think it's funny but it's not."